I returned recently from visiting my dear friends Brett and Ameara in Minneapolis. The last time I had seen them since we all graduated from UT was at their wedding on December 30. Ameara and I spent lots of quality time together shopping, getting haircuts, and just being together. 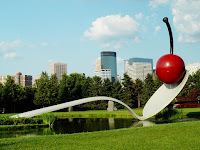 We went to the U (what the natives call the University of Minnesota) and saw its art museum and then later went to the Minneapolis Sculpture Garden, home of Spoonbridge and Cherry. Ameara and I went to see Brett in a cycling race at the National Sports Center in Blaine. That this velodrome was in Blaine got me all excited, Waiting for Guffman-style. The Blaine in Waiting for Guffman is in Missouri, but I feel that they are sister cities on some level. "There's a saying, if you don't like the weather just wait five minutes. In Blaine, with hard work, I think we can get that down to three or four minutes."